Neutrogena All-in-One Make-Up Removing Cleansing Wipes are soft, pre-moistened wipes, infused with a mild cleansing lotion. They not only gently and effectively cleanse and remove all types of make-up but also tone skin, leaving it refreshed in just one convenient step. Moisturizing ingredients prevent over-drying and leave your skin feeling soft and looking healthy. The large cleansing surface provides a complete cleansing experience, without leaving pore-clogging residue. Gentle enough to use around sensitive eye area, even for contact lens wearers. 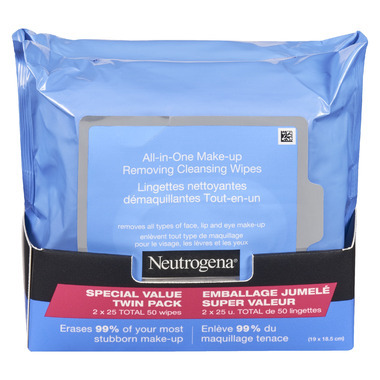 Keep Neutrogena All-in-One Make-Up Removing Cleansing Wipes handy for effective, convenient cleansing. In your gym bag, back pack or purse for on the go for cleansing at the gym, office, or during travel! I have been using these wipes for years, I have try others but keep coming back to these. One of the few wipes that dont sting my eyes and gets most of my makeup off, but it is still important to follow with a cleanser to get rid of any remaining makeup! I trust Neutrogena ingredients on my skin and use these towelettes to freshen up as well as remove make-up. Trustworthy home and travel wipes.